Donald Trump's all-caps tweet threatening Iran with "CONSEQUENCES THE LIKES OF WHICH FEW THROUGHOUT HISTORY HAVE EVER SUFFERED BEFORE" sounds much like his warning last fall that North Korea would be "met with fire and fury like the world has never seen." "Trump has rejected a detailed pact that kept Iran out of the nuclear weapons business for a decade, while embracing a vague communique' that allows North Korea to keep its nuclear weapons for years, and possibly forever," said Richard N. Haass, president of the Council on Foreign Relations, offering his assessment of Trump's decision to pull out of the Iran nuclear deal last May. Trump is now desperate to deflect criticism away from his much-criticized summit with Russian president Vladimir Putin. Trump knows that a war -- conducted with the right spin -- could help the GOP in the midterm elections. And Israel, the United States' closest ally, has been gunning for regime change in Iran, which Israel considers to be an existential threat. Trump is likely threatening Iran to distract from the widespread outrage at his adoption of Putin's denial that Russia interfered in the 2016 election. In siding with Putin, Trump rejected the conclusion of the US intelligence agencies that Russia tampered with the election. "Other people who know Mr. Trump said his decision to respond [to Iran] in such fiery terms was driven almost entirely by his search for a distraction from questions about Russia," according to New York Times reporter Mark Landler. 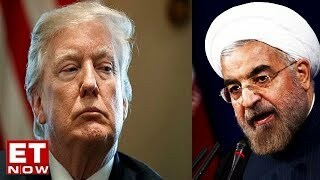 Landler identifies three reasons Trump will not likely follow the same strategy with North Korea and Iran: 1) Iran's leadership is not as monolithic as North Korea's, with Kim Jong Un as a one-man state; 2) the strong Israel lobby opposes diplomacy with Iran; and 3) Trump's unilateral withdrawal from the Iran nuclear deal provides Iran with little incentive to negotiate, particularly because the other parties to the deal -- Britain, France, Germany, China and Russia -- continue to abide by the pact. Moreover, Trump is playing to his base. Christopher R. Hill, who worked as a diplomat in both Republican and Democratic administrations, said Trump's rhetoric against Iran is "raw meat" for his base, as well as "an effort to shift the subject" away from his summit with Putin. Trump then capitulated to Israeli pressure, declaring Jerusalem the capital of Israel, in spite of Security Council resolutions mandating that the status of Jerusalem be agreed upon by the parties through negotiation. Trump's declaration led to predictable outrage around the world.